$750.00 Set of two matching People's Deputy of the USSR badges, with original fitted issue / presentation box, 1989 issue. A very uncommon set of a member of the last legislative government of the USSR. $140.00 1939 World's Fair, NY, Soviet Exhibition Badge. Nickel-plated brass & enamel, hallmarked. American made, Soviet designed. $30.00 Lenin's Portrait and Signature on a Book, award or commemorative badge, circa 1960s-70s. Gilded version in excellent condition. $25.00 Badge for 50 Years of Membership in the Communist Party, with original case of issue. An extremely well-made mint marked piece in sterling silver with gold plating and enamels. In excellent condition. 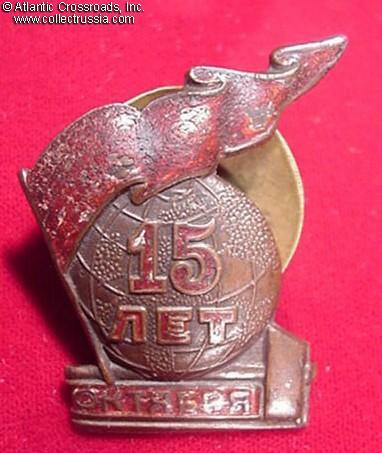 $16.00 Badge for 50 Years of Membership in the Communist Party, late 1960s - early 1980s. Made in sterling silver and "hot baked" enamels, this beautiful lapel pin resembles a miniature Order of Lenin. Variation with the relatively early version of the Moscow Mint logo. In excellent condition. $14.00 Badge for 50 Years of Membership in the Communist Party, circa mid to late 1980s. Made in sterling silver and "hot baked" enamels, this beautiful lapel pin resembles a miniature Order of Lenin. Variation with the late version of the Moscow Mint logo. In excellent condition. $25.00 Document for the badge for 50 Years of Membership in the Communist Party. $170.00 23rd Congress of the Communist Party of the USSR, Delegate's Badge, 1966. Nicely made mint marked piece. In excellent condition. $175.00 24th Congress of the Communist Party of the USSR, Delegate's Badge, 1971. Beautiful mint marked piece in silver gilt and high quality enamels, issued exclusively to the delegates. This is one of the hardest to find of the CPSU congress badges. In excellent condition. $130.00 27th Congress of the Communist Party of the USSR, Delegate's Badge, 1986. Excellent condition. $140.00 28th Congress of the Communist Party of the USSR, Delegate's Badge, issued in 1990 to a participant of the last congress of the CPSU. Excellent condition. $90.00 27th Congress of the Communist Party of Georgia, delegate's badge. Excellent quality and condition. $80.00 15th Congress of the Communist Party of Moldavia, Delegate's Badge, 1981. Very nice piece by the Leningrad Mint, of the same quality as the all-union CPSU congress badges. $95.00 24th Congress of the Communist Party of Ukraine, Delegate's Badge, 1971. Excellent condition. $25.00 26th Congress of the Communist Party of Ukraine, Delegate's Badge, 1981. In excellent condition. $45.00 60th Anniversary of the Communist Party of Tajikistan, commemorative medal, 1989. Excellent condition. $40.00 Fifth International Congress of the Trade Unions, participant's badge, Moscow, 1961. $450.00 Down with Illiteracy Society, membership or donation badge dedicated to the 10th Anniversary	of the October Revolution, 1926 through mid 1927 issue. In hallmarked silver. $135.00 Stalin and Lenin Patriotic Badge, circa late 1940s - early 50s. $130.00 20th Anniversary of the October Revolution, commemorative badge, 1937. Features portraits of Stalin and Lenin covering the globe. In excellent condition and includes scarce original maker marked screw plate. $50.00 30th Anniversary of the October Revolution, commemorative badge, issued in Soviet Estonia in 1947. Features profiles of Stalin and Lenin covering the globe. In excellent condition and includes original maker marked screw plate. $210.00 60th Anniversary of the October Revolution, 1977, badge of an attendee of the special ceremony in Moscow Kremlin. Silver gilt, enamels. Superb quality piece in Excellent condition. $20.00 60th Anniversary of the October Revolution, commemorative badge, 1977. $230.00 50th Anniversary of the USSR, Commemorative Medal for VIPs, 1972. Silver gilt, enamels. Excellent condition and exquisite quality. $30.00 50th Anniversary of the (Rule of) Soviets, commemorative badge, 1967. Fine quality maker marked piece in silver-plated brass and enamels. $640.00 Badge for 15th Anniversary of Kazakhstan, 1935-36 issue. Massive and impressive award in very fine to excellent condition, with beautiful enamelwork and nearly pristine silver finish. $30.00 40th Anniversary of Soviet Azerbaijan, commemorative badge, 1957. $15.00 40th Anniversary of Soviet Armenia, commemorative badge, 1960	In brass and enamels, mint marked "LMD". Nice quality. $25.00 40th Anniversary of Soviet Georgia, commemorative badge, 1961. $20.00 50th Anniversary of the Soviet Georgia, 1971	Brass, enamels, two-piece construction. Fine quality. $19.00 50th Anniversary of the Soviet Georgia, 1971. Brass, enamels, nice quality. $50.00 50th Anniversary of Kirgiz Soviet Socialist Republic, commemorative medal, 1974. Excellent condition. $395.00 5 Year Plan Year screwback badge, large 45.2mm tin commemorative loaded with Soviet symbols: hammer & sickle, Lenin's photo, Lenin's tomb, wheat sheaves, a tractor, etc. Circa late 1920s -early 1930s. See other political and propaganda badges in our "Stalin, Lenin & Friends" section. $60.00 Badge of а Participant of the 1960 Voyage from Moscow to New York aboard the Passenger Liner Baltika. The voyage took Nikita Khrushchev and leaders of several Eastern Bloc countries to the memorable assembly of the United Nations where Soviet premier stunned the world with his infamous shoe thumping antics. $50.00 Soviet Women's Committee, membership badge, 1970s-80s. In brass and enamels, mint marked. A very uncommon and well-made piece. $55.00 Honorary Medal of the Soviet Peace Fund, #14521, with award document to a female recipient, January 1991 issue. Awarded just a few months before the collapse of the USSR in December 1991. $25.00 Ukrainian Committee for Defending Peace, membership or activist's badge, circa 1960s. In very fine to excellent condition. $25.00 Badge of the Leningrad Committee for Defending Peace, circa 1960s. Excellent condition. $45.00 Steamship of Friendship, badge of a Japanese participant of sea cruise to the USSR, 1975. $20.00 25th Anniversary of the Council for Mutual Economic Assistance (СЭВ), Commemorative Medal, 1974. In very fine to excellent condition. $20.00 25th Anniversary of the Council for Mutual Economic Assistance (СЭВ), commemorative badge, 1974. In excellent condition. $50.00 Medal of Honorary Member of the All-Union Society of Handicapped, circa 1970s-80s. $1,600.00 RSFSR International Sports Tournament of July 1920, Jeton for Winning a First Prize. One of the very first Soviet awards or badges of any kind, issued at the time when Lenin was alive and the Civil War was still raging. The striking "revolutionary" design of this piece is very characteristic of its era. $75.00 Badge of a Participant of the 1946 All-Union Parade of Physical Culture. $75.00 Badge of a Participant of the 1947 All-Union Parade of Physical Culture. In very fine to excellent condition and includes original screw plate. See other Soviet Sport Badges in our "Soviet Sports Awards" section. $30.00 October Revolution Anniversary Parade in Moscow, participant's badge, Moskvoretskiy District, 1973. $25.00 Moscow May 1 Parade Badge, 1974. Official badge issued for the occasion to a participant from the Moskvoretskiy District of the city. Reverse shows Moscow Mint logo. In excellent condition. $35.00 October Revolution Anniversary Parade in Moscow, participant's badge, Moskvoretskiy District, 1982. $20.00 May 1 Parade Participant's Badge, Klintsovskiy District, Bryansk Region, 1970s-80s. $25.00 Moscow November 7 or May 1 Parade Participant's Badge, Kuntsevskiy District, late 1970s-1980s.